and Bo Boudart and over 90 guests. The party screened Bo Boudart’s most recent movie trailer for Paying the Price for Peace. Brian addressed the audience spoke passionately about the need for people to speak up against war, live sustainably, and to share their thoughts for peace. investigations into the illegal covert wars promoted by the U.S. in Nicaragua, Honduras, Guatemala, El Salvador, Colombia, Ecuador, Mexico, and Iraq. As a priest he also served on a series of peace missions in many of these countries, and continues to be a leader in the Los Angeles area. On November 4, Brian received an award at the Artivist Awards- held in Barnsdall Theater Park, Los Angeles to a packed audience. This annual event raises awareness for Humanity, Animals, & the Environment through Film & Community Action. While in LA, director Bo Boudart also had an opportunity to interview renowned Vietnam veteran activist Ron Kovic, best known for his book and subsequent movie Born on the Fourth of July directed by Oliver Stone. 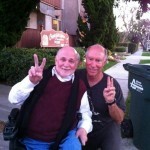 Ron shared many thoughts about his life and 40 years of anti-war activism on camera. He acknowledged that he has a great bond with Brian for many reasons, not least, whose birthday is also on the 4th of July. We continue to plan more production for the documentary over the next several months.